Pin It We had a party a while ago and ended up with a lot of tortilla chips left over. I don't mind them if I am in a Mexican restaurant, as an appetizer or at a party. But it's not the kind of food we eat on a daily basis. 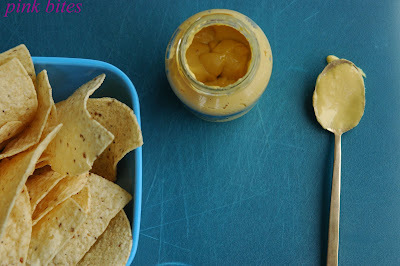 I find it very salty, and I don't like jarred salsas either, so I have to make my own (really good one) every time we want to eat the chips, plus we avoid highly processed foods like this one as much as possible. So I decided to try and use it to coat chicken breasts and roast them. It turned out really good, a nice way to use a left over bag of Doritos. The chicken was roasted, not fried, and I used mustard to coat it first instead of eggs. If you leave some chunks of tortilla chips the chicken turn out crispier and have a nice texture to it. Note: this more an idea than a recipe itself. The quantities and oven time will depend on how many chicken breats you wish to roast or/and how much tortilla chips you have. I would say that for each chicken breast I used approximately 1/4 cup of crushed chips. Season chicken breasts on both sides with salt and pepper and set aside. Crush tortilla chips (I did it in a food processor) and transfer to a plate. 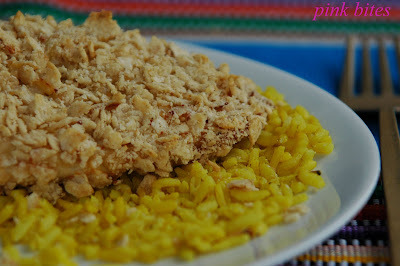 Coat chicken breasts with some Dijon mustard and cover them with the crumbs, pressing down with your fingers. Place coated chicken breasts in a cooling rack set over a baking sheet and roast it until in the preheated oven until cooked through, about 30 minutes.